Thread: SS 29er + Oahu = ?? Wondering what trails to aim for when I visit Oahu next summer.......I took an old single-speed bike and rebuilt it nicely, and I'll send it to my buddy for riding and let him keep it when I'm finished (he'll be back in 3 years).......what trails might work best with this rig? 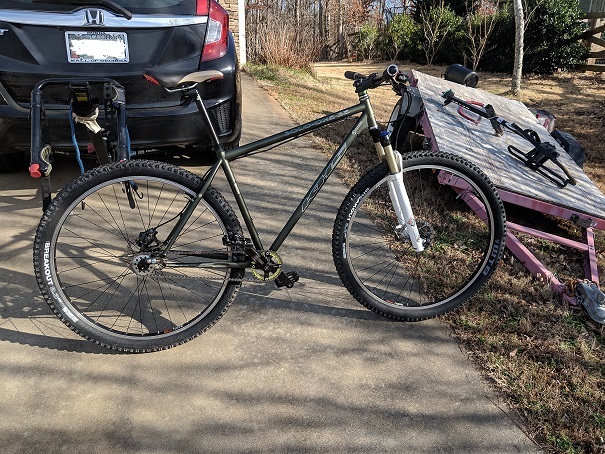 - I'm 56, ride the foothills of the North GA mountains on an SS quite a bit but I'm no mountain goat for sure........appreciate any info - I've already studied trailforks elevation maps for some trails but the locals always know best! I ride a 26 single speed hardtail whenever i m in town. I found that a large cog helps with momentum through the roots. I use a 21 rear cog. Other than the roots, ss is fine for most trails i ride. Manana, Mililani, st Louis, ohana flow. Ohana is actually awesome on single speed. Man, im an midaged guy who likes spinning, i cant imagine flogging my knees on the trails here on a ss. ohana prob not bad. For the most part Sunset should be good. Older Oahu trails tend to be steep climbs and decents with lots of roots. Maunawili Ditch is the beginner friendly trail that you couod practically sprint, but not many ride it anymore so its pretty chewed up by equestrians. Hopefully weather works out for you, its been a pretty wet winter. Most of the trails here can be a mess when wet, high clay content. Unless you have big clearance, theresva good chance of getting packed up with mud. Its not the drivetrain thats a prob, my bike chainline is so close to tire that if it gets any kind of muddy the chain and deraileur becomes mud balls and still works ok, its that you get beehives around the chainstays and forks and your tires simply get jammed. You get off and walk and soon youre shoes are a couple inches taller, and everything is like 10 pounds heavier! There are a few trails to avoid during muddy days. Waimanalo ditch trail and mililani. Rain days my default ride is manana trail and st louis downhill ridden in the uphill direction. Also, i ran 1.95 tires. I guess 2.0 these days. During mid summer i will put on something wider. As Root said, some trails will literally put a haul to your wheel. Yup. They shut fown two popular trails. Aiea loop and tantalas mountain. Those were fun. Mud is just a way of live. You will get use to it, no riding if you wait til is dry. Look at Turtle Bay. It's mostly flat. Ohana is fun if you're a complete animal. I have one friend that does it on a SS, but he's nuts. You're honestly better going to Sunset Hills. The climbs are longer, but not as steep with the occasional break. St. Louis is fun down but you'd really have to catch the bus back up. Kaena point would be a good option too. Don't ride in the mud. A bit of tacky wet is fine, but with the nasty clay soil we have here it gums up the works something fierce and absolutely destroys the trail.